As promised there will be giveaways in the new year, just small tokens of my love. I even broke my no personal spending rule to start the trend. Being as one of the major problems with winter is chapped lips I thought where better to start then with a fun chap stick (well a sphere). 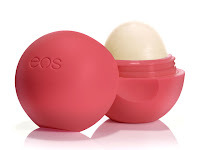 I had read about the EOS or Evolution of Smooth products on other blogs and they gave it rave reviews. Being as I am easily influenced by others I was sold to give it a try. I bought two honeysuckle honeydew flavoured sphere, one for me and one for you at Shoppers Drug mart today. Now I have to say that this balm was hard to track down, but an e-mail I got from EOS told that they they are available at R W & Co as well. This is a 95% organic, 100% natural balm that is paraben and petrolatum free (they are bad guys for our bodies). Also I really enjoyed their instructions of application "twist-off top, pucker up, smooth on, smile" it makes me laugh! So far my freckled sensitive lips have not felt burnt, swelled up or created nasty hives so this is a winner to me. It will take about a week for me to know if it is really beating the winter dry out I normally get. Will this replace my beloved Burt's Bee's with its fun spherical packaging and smooth feel, only time will tell. All you have to do to qualify is sign up as a google follower which in on the right side of my page and comment on this post. Just send me a hey, I would love to try that neat, green sphere of a balm. Anyone from anywhere can qualify as long as you are following me, you have one week from today to sign up. I'm going to use formal snail mail to ship, so if the winner could be patient that would be great. I'm going to put all of the names in an ever so high tech hat and do an old fashioned draw next Tuesday. hey, I would love to try that neat, green sphere of a balm! I love your review Kim. I got a bunch of great lotions and balms for Christmas, one from my boyfriend Jesse's Mom, is a blistex lip infusion balm, its a sunscreen lip protectant and the flavor is Cherry Splash. As a fellow girl with freckled lips I feel your pain!! hey, I would love to try that neat, green sphere of a balm...so much I think that if I don't win one I'll have to go out and buy one. My lips are dry dry dry as we speak. Hey, I would love to try that neat, green sphere of a balm. My lips too are dry and am always in need of a great lip balm! But Danielle to win you must click follow... would love for you to win!! hey,I would love to try that neat, green sphere of a balm!! Yay it worked!!! Hey, I would love to try that neat, green sphere of a balm!! This looks and sounds like a great product. Thanks for sharing!